I am a huge fan of Melissa Clark who writes the “Good Appetite” weekly column every Wednesday in the food section of The New York Times. When we were in San Francisco in August, we visited Omnivore Books, and I couldn’t resist picking up a copy of her wonderful cookbook, “In the Kitchen with a Good Appetite”. For me, the charm of her book is that she includes a delightful and incredibly well-written headnote preceding each scrumptious recipe and its variations. Because my husband loves lamb in just about any form, I am always looking for recipes that he might enjoy. He understands that I am slow to embrace lamb and, likewise, he approaches eggplant with caution. When I read Melissa’s recipe for “Pasta with Turkish-Style Lamb, Eggplant, and Yogurt Sauce” on pages 201-202, I thought we had a winner. Always one to tinker with most recipes, I eliminated the red pepper, which makes Larry choke, and sprinkled it on my portion at the table. Not a fan of mint in anything other than a cocktail, I substituted dill, which Melissa suggests as an alternative. Finally, I halved the amount of butter she suggests for the yogurt sauce, just because we are watching fat these days. I lowered the oven temperature and adjusted some aspects of the recipe’s timing(s) as well. As I was browning the lamb, I felt the dish called out for tomatoes, so I added some. A little lemon zest sparked the yogurt sauce. The recipe printed below represents my adaptation of Melissa Clark’s recipe described above. P.S. HAPPY FIRST BIRTHDAY TO MY BLOG! 2. Spread the eggplant on a sheet pan and toss with 3 tablespoons of the olive oil and a pinch of sea salt. 3. Roast the eggplant, tossing a couple of times during the cooking, for 15 minutes, or until browned. 4. Bring a large pot of water to boil for the pasta. 5. Using a large skillet, heat the remaining tablespoon of olive oil. Add the shallots and cook until limp, about 3 minutes. Add two of the chopped garlic cloves and cook for an additional minute. Add the lamb, salt and pepper to taste and cook until the lamb is no longer pink. 6. Add the roasted eggplant, diced tomatoes and chopped dill to the lamb mixture. Taste for seasoning. 7. Cook the pasta according to the directions. Using a small skillet, melt the butter and cook it until it turns golden brown, about 5 minutes. 8. In a small bowl, mix together the yogurt, a pinch of sea salt and the last chopped clove of garlic. Top with some lemon zest. 9. Pour the drained pasta onto a platter. Top with the lamb-eggplant mixture, then the yogurt sauce. Drizzle with the butter. Garnish with additional dill and red pepper flakes and serve. Wow! You’ve been blogging for a year! Happy Birthday! Thanks, Barbara, the year has flown by! Gorgeous post my friend, and Happy First Birthday! This sounds wonderful. I bet it’s good over couscous and rice too. Larry picked around the eggplant and I did the same with the lamb – but it is a terrific recipe, as most of Melissa Clark’s are – I so enjoy her. I love lamb. I love eggplant. I love spicy hot. I will love this recipe. Comfort food, for sure. I’m thinking of upgrading this with lamb shanks once it gets cold here. Happy Blog Birthday, Liz!! Wow a year gone already! I look forward to many more posts! Thanks, Jayne. I’m going to try and upload Andrew’s “unprocessed” logo on my fb page – not the Liz the Chef one, tho – are you? I love Melissa Clark’s recipes too – they rarely disappoint. And this looks like a great recipe – I like your changes too! And, Liz, great great photo!!!! LOL – I took the shot as the light was fading, carrying that silly plate all around the house until I put it on my Mom’s marble table in the living room just before sundown…Thanks! Happy birthday to you….happy birthday to you…. (you know the rest). 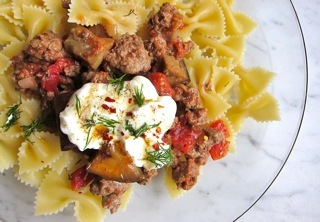 I LOVE pasta dishes with lamb, and anything from Melissa Clark is a great place to start when you’re feeling creative. Thanks, Steve, nobody else has sung to me today! This also sounds like the perfect recipe for my husband and I – we’re in the same boat! I too don’t always love lamb and he’s not crazy about eggplant. This sounds delicious. I would never think to put yogurt sauce on pasta but it looks so good. Need to pick up that cookbook! Yes, the cookbook is wonderful – I had looked through it twice before I noticed there were very few photos. Interestingly enough, I don’t miss them. This looks great and we both love lamb so I might actually try it! Happy Blog Birthday!! !